Set a pan over high heat. Make sure you have a cover for it. 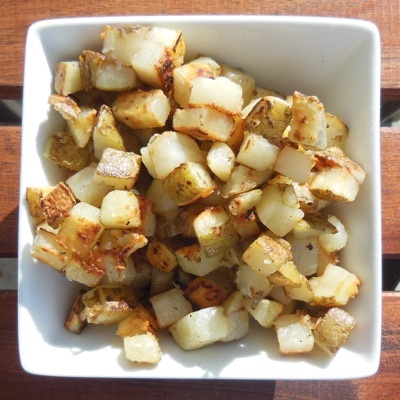 In a Ziploc bag or bowl, toss the cubed potato with 2 TBSP of oil and salt & pepper to taste. Set potatoes in pan and cover so the steam will help cook the potatoes. Cook for 15-18 minutes, stirring occasionally. Keep an eye on them to make sure not to burn them.